Use of EMS mutagenesis for development of forage brassicas with tolerance to sulfonylurea herbicides. Mary Christey, Robert Braun, Fernand Kenel and Andrew Dumbleton. There was a great deal of interest in both presentations. With the talk on EMS mutagenesis there was interest in the success of our development of a commercial cultivar from this research. There was interest in my protoplast regeneration research and successful shoot regeneration from protoplasts because of the increased interest in gene editing via protoplasts. This conference was well worth attending, with over 500 delegates from 54 countries attending. Over the five days of the conference there were 12 keynote talks and 34 sessions, with over 200 oral presentations. In addition, there were also 156 poster presentations covering eight themes. In addition to presenting my own research, the ability to attend talks on the latest research developments was invaluable. I was also able to meet in person with other researchers. Some highlights of particular interest to New Zealand are outlined below. There were numerous talks covering the latest developments in gene editing technology that enable precise gene editing. Previously, single traits were edited, but advances in CRISPR/Cas technology now mean that several talks were on editing of multiple genes. There were also examples of progress towards de novo domestication of wild species. In some cases some genes involved in domestication are detrimental, therefore repeating domestication and targeting only genes of interest preserves genetic diversity. Tomas Cermak from Inari Agriculture Inc. demonstrated this with wild sp. of Solanum, where simultaneously targeting several genes created an enriched crop from a wild tomato progenitor in a single step. Several researchers from the Leibniz Institute of Plant Genetics and Crop Plant research (IPK) presented research on gene editing in malting barley, with the aim of altering a single gene that causes off-flavours. Goetz Hensel (IPK) presented results that showed that altered plants have been obtained and pilot brewing trials are in progress. Sophia Gerasimova (IPK) presented research on switching from hulled to naked barley by a single base pair deletion. Ewen Mullins from Teagasc (Irish Agriculture and Food Development Authority) presented research on Ensifer-mediated technology. They have developed a strain of the bacterium Ensifer adhaerens and successfully shown that it can transform a range of crop plants, but unlike Agrobacterium it is non-pathogenic. Cathie Martin from the John Innes Centre and Norfolk Plant Sciences (NPS) gave a keynote presentation about the importance of plants in our diets. She presented results outlining their research in tomatoes to make bio-fortified foods. NPS has developed a suite of tomatoes, including genetically modified purple-fleshed tomatoes which contain the high concentrations of antioxidants and anthocyanins normally found in fruits such as blueberries and blackberries. Henry Daniell from University of Pennsylvania and PhylloZyme discussed the latest developments in chloroplast genome expression in lettuce for the development of enzymes and biopharmaceutical products. The advantage of chloroplast genome transformation in leaf-derived products is that no seed or pollen transmission occurs, and freeze-dried leaves are stable for several years. Products under development include pectin lyases, lipases, mannanase, and oral hygiene products. Prem Bhalla from the University of Melbourne presented research that showed that overexpression of a DNA/RNA helicase gene in canola resulted in plants with improved water and heat stress. Another prominent research area at the conference of relevance to New Zealand science was the importance of the plant microbiome, and the realization that plant biotic and abiotic fitness traits are influenced by its microbiome. Brian Murphy from Trinity College presented research which showed that in the presence of the appropriate endophytes, barley could be grown with 50% less nitrogen fertilizer. In addition, a 9% higher yield was obtained, but this was cultivar-specific. Angela Sessitsch from the Austrian Institute of Technology presented research on the role of beneficial bacterial microbes in several crop species including potato, maize and wheat. In addition, she discussed their EndoSeed™ technology, which involves spraying flowers with bacterial endophytes which colonise the rhizosphere of the next generation and promote plant growth. Successful results were shown with wheat. Shoot regneration from kale protoplasts 3 months after culture. 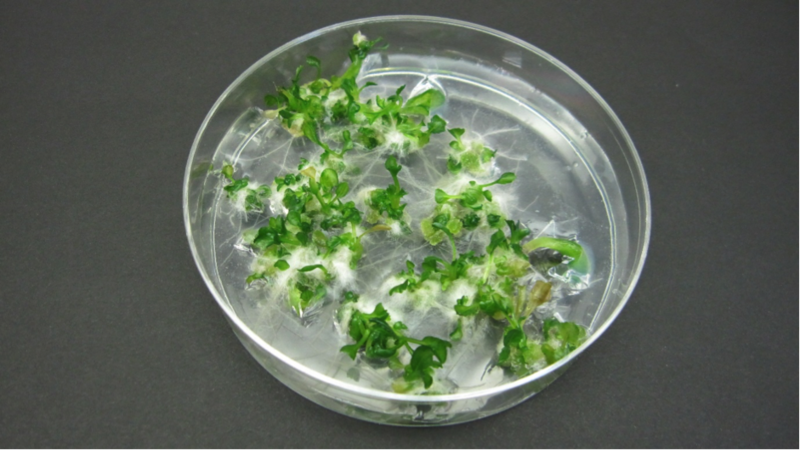 Protoplasts were isolated from leaves of in vitro shoots of several Brassicaand Solanumtypes including forage kale (B. oleracea), radish (Raphanus sativus), potato (Solanum tuberosum) and pepino (S. muricatum). High yields of viable protoplasts were obtained in all cases. Division of protoplasts and the development of small colonies was noted with all genotypes tested. However, plating efficiencies and the extent of shoot regeneration varied between genotypes. The development of shoot regeneration systems from protoplasts for these plant types will enable the manipulation of these genotypes via a range of biotechnological applications including ploidy manipulation, protoplast fusion, and gene editing. 1 The New Zealand Institute for Plant & Food Research Limited, Private Bag 4704, Christchurch 8140, New Zealand. 2PGG Wrightson Seeds,PO Box 175, Lincoln 7640, New Zealand. Brassica oleracea(forage kale) lines with increased tolerance to the sulfonylurea herbicide chlorsulfuron were developed through EMS mutagenesis of seeds. Field analysis of advanced breeding lines developed from the original mutants confirmed tolerance to the sulfonylurea herbicide Telar®. The sulfonylureas are a class of herbicide used extensively for selective weed control in arable crops. The mode of action of sulfonylureas is to inhibit the chloroplast-localised enzyme AHAS (AcetoHydroxyAcid Synthase), a key enzyme in the formation of branched chain amino acids. This leads to a deficiency in these amino acids and the accumulation of the AHAS substrate, 2-ketobutyrate, which is toxic. Point mutations in the AHAS gene can result in herbicide-tolerant phenotypes by altering the herbicide binding site while retaining the catalytic activity of the enzyme. Five conserved domains are implicated in resistance to AHAS inhibitors across a range of naturally occurring and artificially generated resistant genotypes. Molecular analyses of the conserved domains of the AHAS gene indicate a proline to leucine substitution in Domain A is responsible for the resistance.